MarchOnHarrisburg will be working with these organizations fight to end corruption, make voting more accessible, and make the democracy of the Commonwealth stronger and more inclusive than it has ever been. “Our united and diverse coalition hopes to inspire legislators to vote for positive, values-based progress. 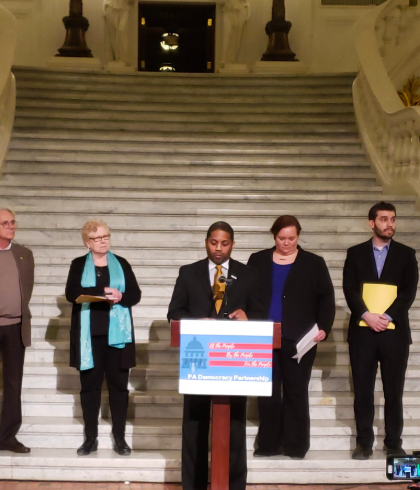 Together, we will prove that unity and perseverance among ordinary Americans can overcome special-interest lobbying and corruption in the statehouse,” said Common Cause PA Executive Director Micah Sims at the press conference yesterday. Along with Sims, League of Women Voters PA Executive Director Jill Greene, MarchOnHarrisburg Executive Director Rabbi Michael Pollack, and Represent Us PA Regional Organizer Peter Ouellette spoke about our joint-legislative agenda for the 2019-2020 session. The Partnership will be traveling across the state this year, hosting a “Democracy Roadshow,” to talk to voters about our joint agenda and growing the movement. In addition to the press conference yesterday, members of the Democracy Partnership joined MarchOnHarrisburg in lobbying elected officials about our new legislative agenda for 2020! “I was thrilled to speak with legislators who shared my views about the need for legislative reforms...and two of them were young Republicans-Megan Schroeder and Jonathan Hershey, I was also inspired by speaking with two seasoned Democratic leaders - Margo Davidson and Anthony Deluca...No doubt that the rose colored glasses of a newbie will be whipped off eventually but for now I am encouraged.,” said Carol Stowell, MoH York Chapter leader, who led five York chapter volunteers throughout the day. We are stronger together and have never been more excited to be a part of the Democracy Movement in PA! We Won the First Battle for Secure Voting Machines in Philly!